Last week the U.S. Bureau of Economic Analysis released both the latest estimates for state personal income along with their comprehensive revisions they do every 5 years. These big, comprehensive revisions occur first at the U.S. level and were released over the summer. They have now filtered down to the state level estimates and are pretty big here in Oregon. First, however, let’s take our standard snapshot of how incomes are growing here in Oregon over the past year and the past quarter. Overall personal income in the state is up 4.7% over the past year, and up 4.4% over the past quarter (on an annual basis). This growth was pretty consistent across the various types of personal income, from wages, to dividends, and the like. The one exception is the volatile farm income which gets pushed around not just by harvest, but the value of the US dollar and commodity prices. All told, Oregon’s income growth is above average, but is no longer growing at the peak growth rates seen a few years ago. While the latest data brings good news and confirms what we’ve seen in the more timely economic data, the bigger story from the release are the comprehensive revisions. As you can see below, much of history remains the same, but Oregon’s income has been revised upward pretty significantly in recent years. This revision amounts to about +$7 billion, +3.6%, in 2017 alone. The importance here is twofold. First it indicates that Oregon’s economy has performed better than we first thought. 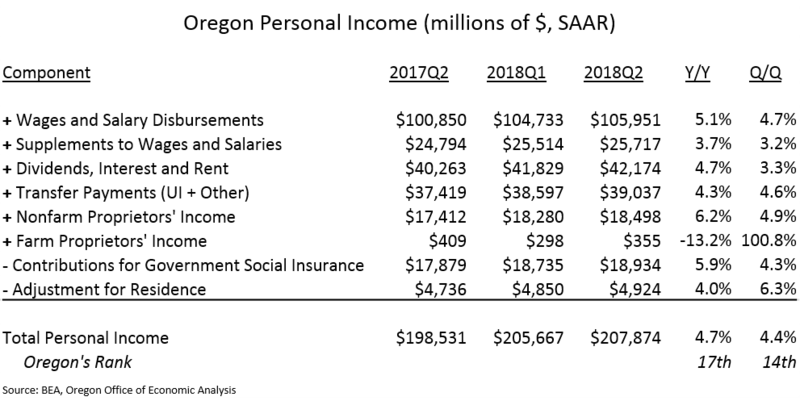 The total amount of personal income earned by Oregonians is larger than we thought based on the prior estimates. This is good news! Second, however, these revisions mess with our underlying forecasts as we use this data in our economic and revenue models. Everything else equal, these upward revisions mean more income for Oregonians moving forward because the jump-off point from where history ends and our forecasts begin has now been shifted upward. That said, this does not necessarily translate into more tax revenue in our forecasts because it’s not like tax collections were also revised higher for 2016 and 2017. We know how much money was collected. So the impact here on our forecasts is more about how do these revisions, plus everything else going on in the economy, affect our expectations moving forward. We are meeting with our advisors next week, and again in a few weeks as we work to finalize our next forecast — due out November 14th. In terms of the breakdown of the revisions, an interesting pattern is seen. Two-thirds of the revisions came in investment and business income. This pattern largely matches the U.S. revisions over the summer. As the BEA noted earlier in the year, they were incorporating updated and new IRS tax return data for corporations, sole proprietors, and partnerships. Essentially, the prior income figures had significantly underestimated these revenues (but we have certainly seen this growth on the tax collection side in recent years). The remainder of the revisions had less of an impact on the topline. That said it was interesting to see that benefits for workers (supplements to wages) were revised up more than wages. 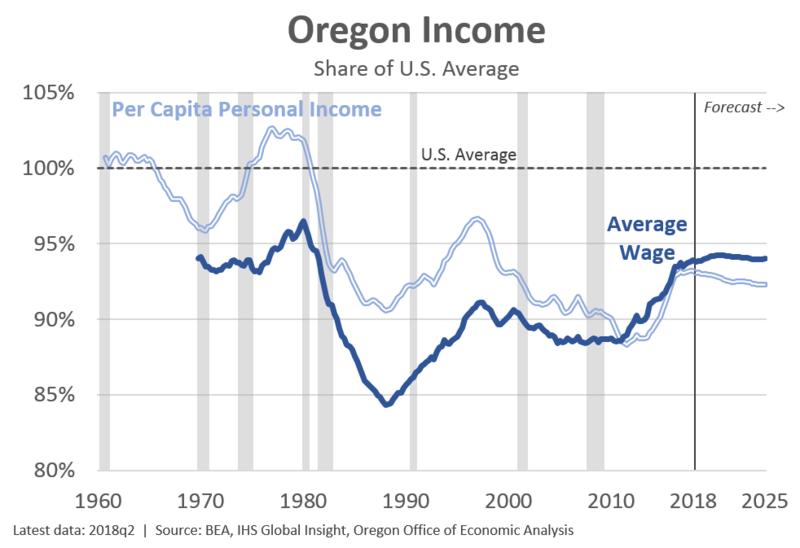 In recent years we have seen a gap emerge between different wage measures here in Oregon; namely the BEA measure of wages has lagged withholdings and also the QCEW wages. These revisions help correct some of that gap. 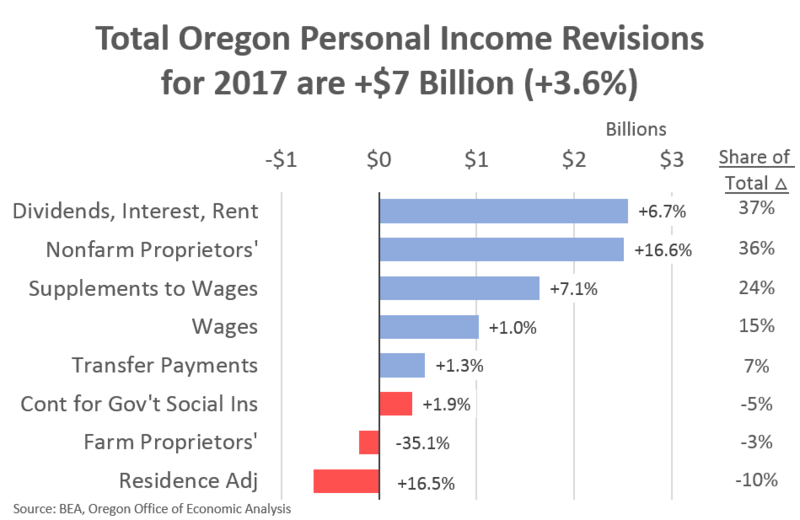 Finally, these income revisions have boosted Oregonian incomes to a larger degree than the typical state. 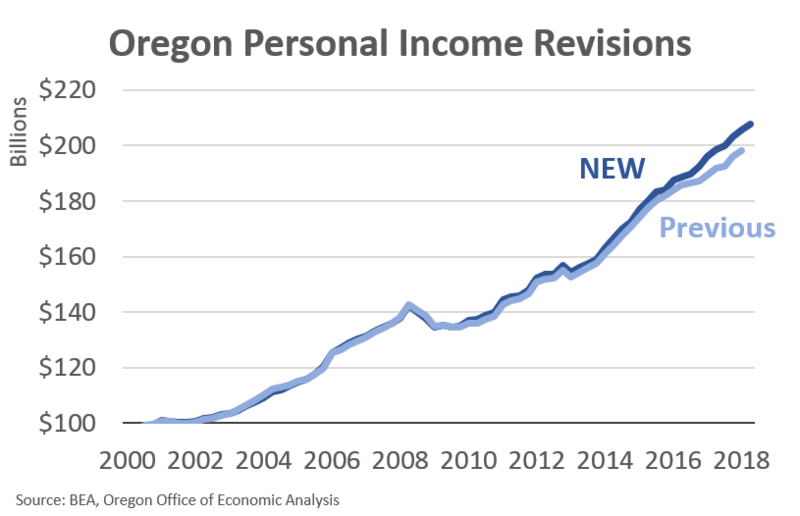 As such, Oregon’s per capita personal income, relative to the nation, has been raised. Oregon currently stands at 93% of the U.S. average, the highest point we’ve seen since the dotcom crash in 2001. Oregon’s average wage currently stands at 94% of the U.S. average, the highest point we’ve seen since the mills closed in the 1980s. These gains are driven by the stronger economic expansion Oregon has experienced in recent years. The expansion is reaching all corners of the economy and of the state. And Oregon’s median household income is now on par with the U.S. overall.